The ISAF Sailing World Championships is Olympic sailing’s most prestigious regatta outside of the Olympic Games and the principal qualification regatta for the Olympic Sailing Competition. 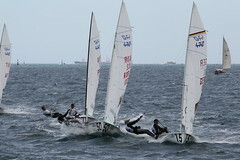 The ISAF Worlds are held every four years. With over 1,500 sailors and more than 1,000 boats representing 80 nations expected to attend, it is set to be the biggest-ever event for Olympic sailing. Online entry will be directly via the Official Event Website and accessible to ISAF Member National Authorities only. Details of those countries eligible to enter and the number of entries per event is updated on the ISAF Website.